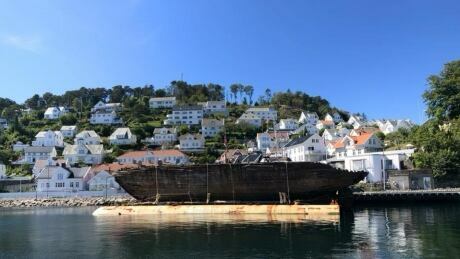 One hundred years after a wooden ship set sail from Norway with the hopes of reaching the North Pole, the vessel has finally returned to its country of origin. The Maud, a historic vessel named for Queen Maud of Norway, crossed into Norwegian waters earlier this month, marking the beginning of the end of a longtime dream to return it to Vollen near Asker. That's where the ship was built in 1917 by Christian Jensen. The Maud was last in Norway when explorer Roald Amundsen set sail from Kristiana, now Oslo, in July 1918 for the North Pole via the Northwest Passage. Amundsen was the first expedition leader to sail the Northwest Passage and the first person to reach the South Pole. Amundsen never reached the North Pole on the Maud. Running into financial troubles, he sold the vessel to the Hudson Bay Company in 1920, which used it as a floating warehouse before it sank. In 2016 the Maud was rescued from the shallow coastal waters of Cambridge Bay, Nunavut, by a team of four Norwegians who launched the 'Maud Returns Home' initiative. They began their quest to recover the ship six years prior. The Maud had sunk there in 1930 and, partially above water, was a longtime local landmark and tourist attraction. A seven-foot high structure made of rocks called a cairn now takes its place on the shore. The Maud began its journey home in late August 2017 when it was towed on a barge, named Jensen for the architect, to Aasiaat on West Greenland in September, where it stopped for the winter. After the water opened, the team left Greenland in late June 2018, setting course for Norway. The team has documented each step of the journey on the project's Facebook page. Twenty-eight days after leaving Aasiaat, the Maud stopped for a rest on one of Vestmannaeyjar's small islands off the south coast of Iceland to wait for windy weather to pass. "Maud is doing well across the big seas and we look forward to arriv[ing] in Norway in not so long," project manager Jan Wanggaard wrote on Facebook. The "100-year-old queen of the Arctic" reached Farsund on Monday. The crew stopped in Arendal, a municipality in southeastern Norway, on Wednesday. "It was joyful to make a short stop in Arendal today. Lots of people and great enthusiasm for the return of Maud after 100 years," Wanggaard wrote.